Celebrating the first release candidate for Drupal 8, the Advomatic team has been testing things out, diving into not-so-well documented (yet!) waters. 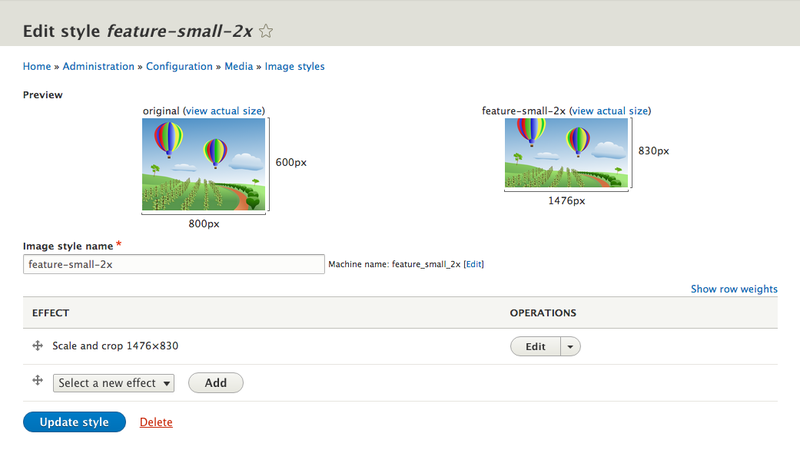 Here’s a little tutorial for doing something that had us scratching our heads for a bit: adding responsive images in Drupal 8. Since Breakpoint module was added to D8 core, you can now define your theme’s breakpoints in code (and categorize them into breakpoint groups – for example, one group for image-sizing breakpoints and one for layout-related breakpoints). There is no UI for doing this, but Breakpoint module gives us an API that allows modules and themes to define breakpoints and breakpoint groups, as well as resolution modifiers that come in handy when targeting devices with HD/Retina displays. To do this from your theme, simply create a yourthemename.breakpoints.yml file in the root of your theme directory. For the purposes of simplifying this tutorial, we will be creating two, simple, device-agnostic breakpoints: “small” and “large.” Under normal circumstances we would be using more. The weight of these is crucial so that the proper image styles get swapped in depending on viewport size and screen resolution. Here, a breakpoint’s weight should be listed from smallest min-width to largest min-width. Modules, however, can reverse that order if needed, as the Responsive Images module does. Also, note the “multipliers” section. Breakpoint allows for different pixel density multipliers for displaying crisper images on HD/Retina displays: 1x, 1.5x and 2x. More on that below. Depending on how many breakpoints you have, you will need to plot out what your image sizes will be for each breakpoint range. In our case, we’ll do a simplified version with just two image styles, one for each of our breakpoints. 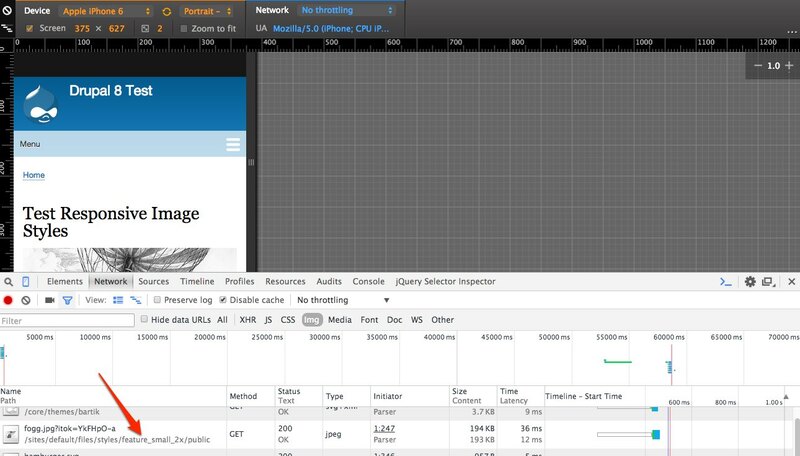 As an aside, here’s an interesting presentation on doing the math for your responsive images before you even get to Drupal. The presenter, Marc Drummond from Lullabot, uses a rule of 25% to choose his image styles. For a hero image, for example, he starts with 320px (generally, your starting maximum width). Then he picks his next breakpoint at 320 x 1.25 — 400px, then 400 x 1.25 — 500px … on up through 1600px (tidying up the numbers a bit to make more sense later). Below is what I’ve chosen for my image styles, basing each on the largest width and height it will need to be before the next breakpoint snaps into place. I’m using a 16:9 aspect ratio across the board here to make crops, but yours may vary, based on the layout changes among breakpoints. These all use the “Scale and Crop” effect. Now I’ve got a slew of image styles all ready to go! 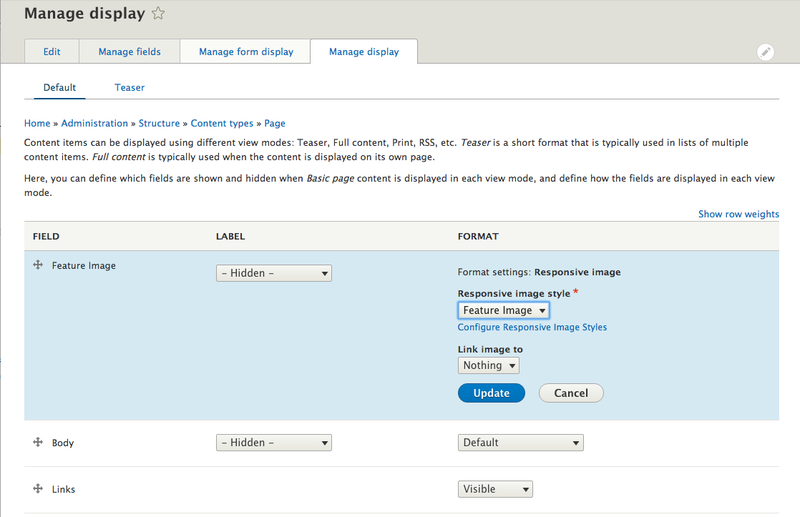 Drupal 8 makes the big leap and uses the HTML5’s Picture element to display all our different image styles and pick the right one. 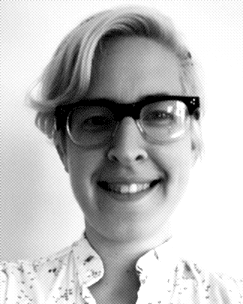 It’s essentially a container that allows for multiple sources for a single image tag. Let’s see how it works. The source tag allows you to state your breakpoints and the image source to use in that case (with a regular and a 2x version). The img tag provides your fallback image — it will show when the others don’t apply. So the work we’ve done so far is basically providing all the parameters for the picture element that we’re building. Note that the source rules are listed from largest to smallest. 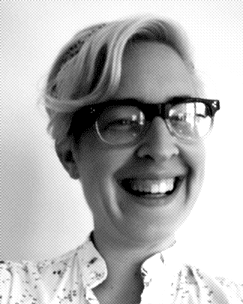 Now let’s put it all together in Drupal. Add a new responsive style, selecting the breakpoint group you are going to use here — in my case, I’m using my theme’s breakpoint group. For each breakpoint, I’m choosing a single image style — but you can also choose to ignore that breakpoint, or even load multiple images styles based on different size criteria you specify. In my case, I added a field to the Basic Page content type for the Feature Image. 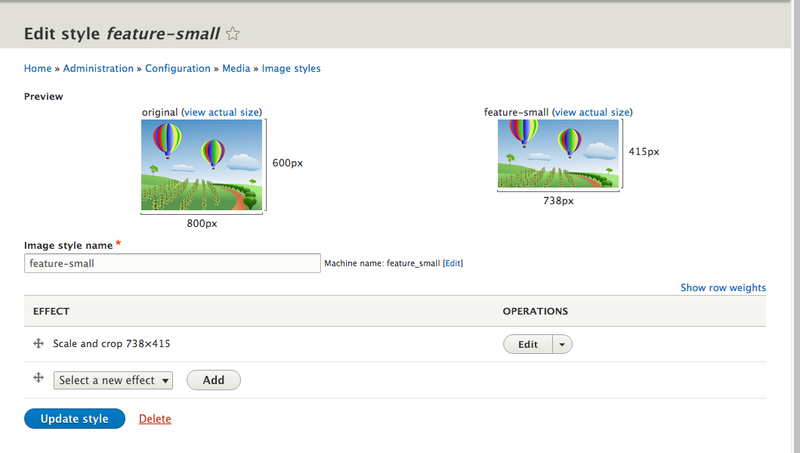 Set the Format Settings to “Responsive image” and select your new Responsive image style. Now check your work. One thing that makes it a little more difficult is that the web inspector won’t tell you which version of the image is loading just by looking at the DOM; the picture element markup looks the same no matter what breakpoint you are in. Instead, you will need to peek at the browser’s web dev tools (such as the Network tab in Chrome) to see which version of the image has downloaded. As you can see, this method can be as simple or complex as you need it to be. But I think Drupal 8’s new system allows for the flexibility for the range of devices and breakpoints we have now. This just made my day. Thanks for sharing!! Very useful! That’s a step by step working tutorial. Thx! Any idea on what to do with inline images? Awesome run-through. 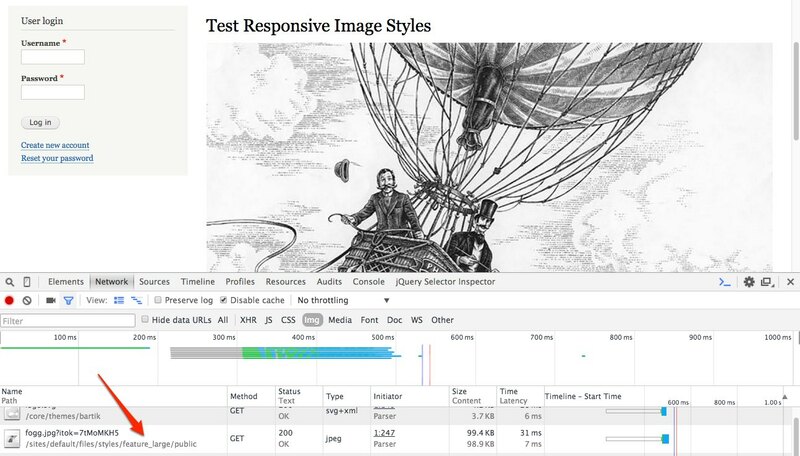 Have you tried responsive images using image_replace in D8 yet? It should allow me to replace the images completely by breakpoint, but I haven’t had any luck getting it configured. Great article. Was looking for this. Well written. Thanks. That’s cause its a HD screen with a higher dpi than the wide screen. But my ZURB Foundation theme does not appear as a choice in the theme dropdown menu, so how do I set the breakpoints? 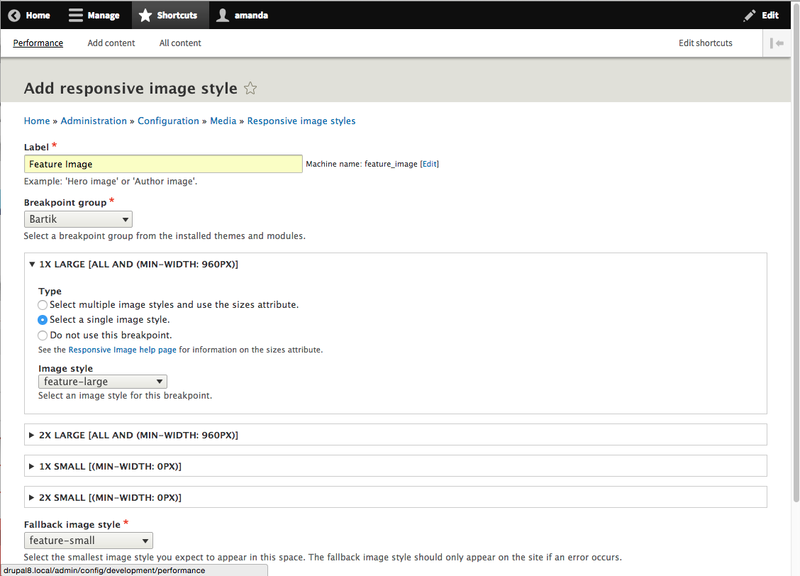 Using the Responsive Image setting for the theme does not seem to work. Can we do this without using the picture tag and just using srcset? picture tag isn’t very well supported.